Koster KD System – Stops water instantly! The Koster KD System stops active water ingress and safely seals off pressurized water from the negative side within seconds! Depending on the intensity of the active leak, a sufficient amount of dry powder can be applied by hand directly to the active leak. In cases of small active leaks (where water slowly drips from the wall), Koster KD Blitz powder should be rubbed firmly onto the surface until the leakage is stopped. Areas with stronger leaks (including an active water spout), a larger amount of Koster KD Blitz should be pressed firmly onto the leak. After a few seconds the leak should be stopped. This fast curing mineral sealing slurry offers excellent resistance to aggressive ground water and high-water pressure. Koster KD Blitz is a highly reactive powder offering extremely short setting times. With the application of Koster KD Blitz, active water leakages are sealed within seconds. 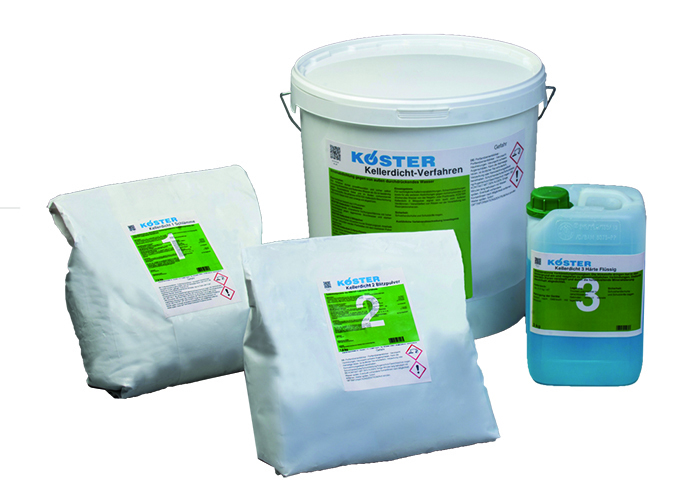 Koster KD Sealer is an extremely low viscosity silicifying liquid. The active ingredients penetrate deeply into the substrate and react to form an insoluble compound. The pores are plugged and permanently sealed through the mineralisation process.